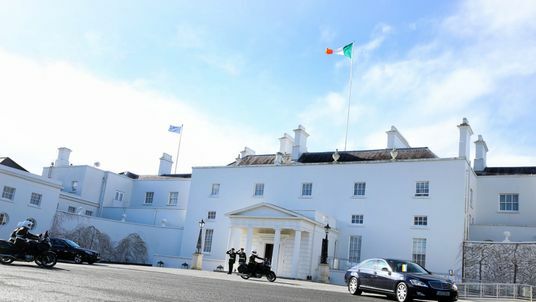 Security is being reviewed at the official residence of the president of Ireland after a housing protester walked in unchallenged and accosted the 77-year-old, according to reports. 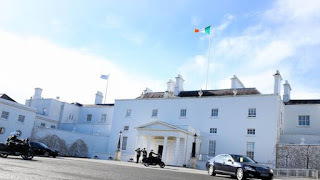 On Friday, a middle-aged woman was reportedly able to drive to Aras an Uachtarain and walk through the security cordon unchallenged into the president's official home and workplace. President Michael D Higgins was reportedly working in an office near the main lobby when the woman accosted him, although he was not attacked or assaulted. According to the Irish Daily Mail, the president "calmly tried to defuse the situation until the gardai arrived." Sky's Senior Ireland Correspondent David Blevins said: "To describe this as an embarrassment to those responsible for the president's security would be an understatement. "Michael D Higgins is Ireland's Head of State so this is on a par with the Queen encountering an intruder in her bedroom at Buckingham Palace in 1982. "Given the level of the international terror threat, there will have to be a significant review of security around the president in the wake of this." A spokesperson for An Garda Siochana said the Irish police force did "not comment on the detail of security arrangements for the president". However, they added: "Following a recent incident at Aras an Uachtarain, a chief superintendent is conducting a review of security measures and another chief superintendent is investigating the incident." Irish public broadcaster RTE reported that the front gates to the building were open because of maintenance work, and that the investigation will query why the woman was not stopped at the gate or at any other point before reaching Mr Higgins. The woman was not arrested as "the president did not want the matter to be taken further" according to reports. The president's media office has declined to comment.